Our daughter was born 4 years ago this Saturday. This week we celebrate her birthday and her health by donating to the Ronald McDonald House in Spokane. She was born at one pound and eight ounces. I was 26.4 weeks along. It was a nightmare. 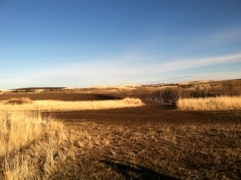 You can read about it here if you like. Since we live in a small community in the middle of freakin no where (no bitterness about that) the Ronald McDonald House has not only served us but many other families who live in the area. We feel like we’re really helping and that is awesome!! My husband is a far better writer than I. He went to a UC college and I squeaked through a State college…yes, I graduated and have my bachelors. You thought I was just another pretty face or mean running machine. Well then, have you gone to the bathroom at Graze? I am really proud of the sink counter. It was our kitchen countertop and I refinished it and installed it. Pretty good huh. 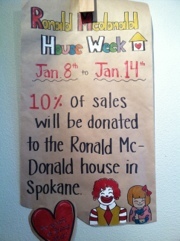 Did you notice the newspaper article about the Ronald McDonald House in Spokane and our yearly fundraiser? Those kids in the picture are ours, we are proud of them too. So here is the deal. Four years ago our daughter was born really early, and she was really sick. So we spent a lot of time in Spokane at depressing hotels. We were referred to the Ronald McDonald House and our visits got a lot better. So every year during the week of Frances’ Birthday we donate 10% of our sales to the RMCDH in Spokane. We are so thankful to the house and its comforts for those in need; and we are so blessed to be able to give something back to a truly special place. What was a sad time, thankfully turned into a happy time. We are truly lucky to give back! 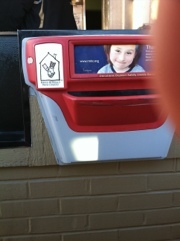 Now whenever I cave and reluctantly take my kids to McDonalds I don’t feel so guilty. Have you ever had anything life changing happen to you? We’re you able to give back? Don’t lie, do you take your kids to McDonald’s every once in a while? Just spent a lot of time reading back through your 2008….W.O.W. I have a whole new vision of you. What a mom. What a family. Incredible. And Marit? Have we made this connection before and I just forgot? Love Marit! And hell yes I go to McDonalds. LOVE McDonalds. It IS a food group! What a great way to give back. We’ll be in! Wow. Amazing story! So glad your tiny little girl is now a healthy 4-yr. old. And good for you for making a valid point here. I eschew McDs, but now you’ve given me some food for thought. What an incredible story and I’m so glad your daughter is healthy (and clearly adorable from the following post) little girl!